with manual trans and the 1.8 liter gas motor. It is only rated at 170 hp and 200 torque but the car only weighs about 33 or 3400# and it steps out smartly. It is rated at 21 town and 30 highway but car and driver said they got 33 highway on a trip, though it would be surprising if it is that much higher. I was planning to get a fwd manual with the little 1.4 motor rated at 37 mpg highway but spotted this car with the upgrades that came with the alltrack, including heated vinyl seats and 17" rims. 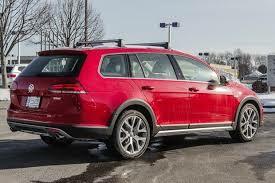 The seat bottoms are wider than my old sportwagen and the newer body style gives better outward visibility. Otherwise the interior is very familiar. The Mrs complained about the lack of split heater cores like the mb and Porsche, but I figured out almost all the controls which are different than my old VW by the time we got home today from our little jaunt to Indy. It is tornado red which looks like Ferrari red to me. It sits about 2" higher than the fwd and i am thinking about lowering it back down like the fwd if I can do it simply. I'm wondering if they put in spacer, taller springs or just taller springs...? All the trouble with the cayenne and conversations with the service mgr convinced me to reluctantly buy a gasser. The pics are not my car, but you all always insist on pics...? Last edited by t walgamuth; 03-16-2019 at 11:08 PM. If they built it today likely it would be a a three liter v6 with two turbos and twice the horsepower and twice the fuel economy! Id love to see a lawnmower engine adapted to direct injection with a tiny turbo. Probably been done already. The I.8 gas engine if it has been in production for several years. Is probably a safer bet than their new 1.4 gas engine with a turbo. Perhaps more drivable with the manual transmission as well. The 1.4 drove well even with the automatic. I just was seduced by the thought of the 1.8 being sportier. It is a nice soft ride. Reminds me a lot of a 240d but with more power and more gears to chose from. If not for wanting out of the diesel cayenne I would have bought used. The dealer did not seem to want to trade down with me and have to give me a check. I looked for long enough to become convinced that the diesels would be problematic enough to go with a gasser. It seems dealing with the pollution issues and the problems that it creates. Has pretty well finished the newer car diesels. The savings in fuel is chewed up by the maintenance requirements. Or a hefty percent of it can be. The golf also seems to have been increasing their body size. One other advantage of the diesel was a longer engine life. Many of todays gas engines can reach very high miles now as well. Although with the current complexity probably the cars will develop too many non related problems to keep them that long. 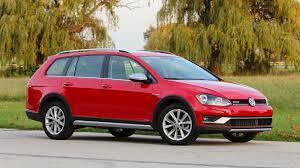 Volkswagon seem to be about the only company left in direct competition with some of the Japanese brands. Although you would think they would go all out to build a reliable longer lasting automatic transmission. Even if they had to buy the rights to produce a similar unit to one that is. That issue has gone on far too long. Toyota seems to have a sound strategy. They seem to me to stick with the older technology until they think the newer types have worked out well in other brands first. Before their adoption of it in their product lines.